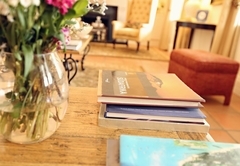 Ashbourne House is a 4 star graded guest house offering Franschhoek accommodation in 8 guest rooms. 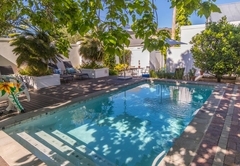 Ashbourne House is a meticulously restored colonial retreat set in tranquil gardens with soaring mountain views, in the quiet historic centre of the Franschhoek village. 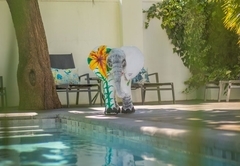 Sumptuously appointed air-conditioned rooms, each with an en-suite marble bathroom, own entrance and private patio. 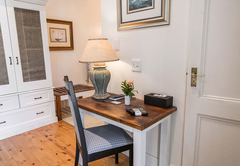 At Ashbourne House we have one aim to ensure our visitors experience Cape hospitality at its very best, with attention to the smallest detail and the highest of standards. 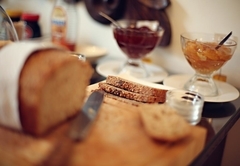 Look forward to delicious full country breakfasts with fresh fruits, home made preserves and freshly baked bread and croissants. 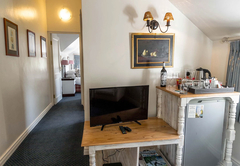 Drinks are served in an elegant and supremely comfortable guest sitting room with feature stone fire place, and doors to a wide shady veranda, there are double doors leading to the spacious breakfast room. The stylish décor of the house reflects the period elegance of its past, combined with contemporary design and every modern comfort. 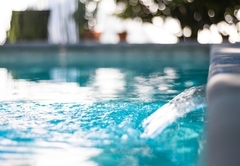 Soak up the sunshine and pure mountain air whilst lounging on the sun deck under palm trees, or take a dip in the heated swimming pool in our secluded gardens. Log fires and under floor heating cocoon you in the green season. On a quiet corner in the historic centre of the village. 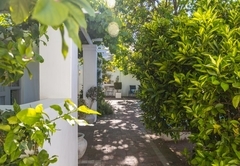 Stroll to acclaimed world class restaurants (we have 8 of the top 100 restaurants in South Africa), boutiques, galleries, antique shops, jewelers; cafes, arts and crafts, museums and all the village has to offer with its vibrant cosmopolitan atmosphere. 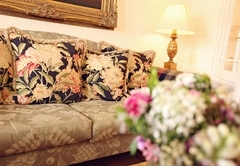 There are no less than 26 wine estates within 2 to 20 minutes of Ashbourne House. 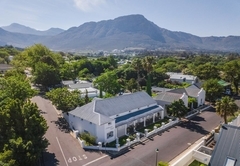 Franschhoek is one of the top destinations for visitors and is the perfect base for extensive sightseeing of the entire Western Cape. 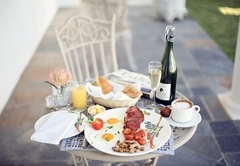 From pristine beaches to the majestic mountains of the winelands. 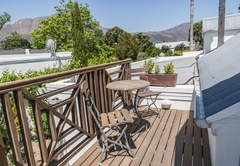 Just one hour from Cape Town and 45 minutes from Cape Town International Airport. Hermanus 90 minutes. 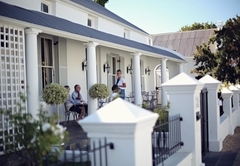 Stellenbosch and Paarl are both just 20 minutes drive away. 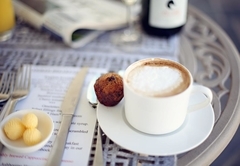 A very warm welcome awaits you at Ashbourne House. Ashbourne House has a no smoking policy; smoking is restricted to private patios and balconies only. 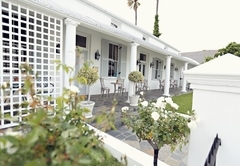 Set off the main house?s front veranda, this suite overlooks the rose garden and a quiet residential village street. 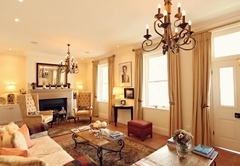 It has a queen-sized bed, en suite luxury marble shower room and a cozy separate sitting room. 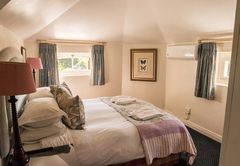 This large ground floor room is situated in the main house; with a king-sized bed (which can be made up into twin beds); luxury marble en suite shower room and large sitting area. 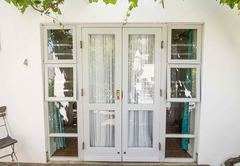 The room opens onto a protected, shaded patio with courtyard garden views. French doors open onto a shady private patio with pergola and mountain views, all in the shade of an ancient coral tree. 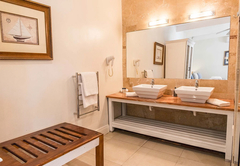 This spacious room has a king-sized bed (which can be made up into twin beds), comfortable sitting area and an open-plan luxury marble bathroom. 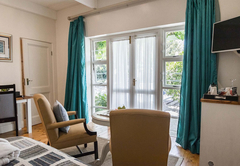 With French doors that open onto a vine-shaded patio and mountain views over the swimming pool, this light-filled, spacious suite contains a queen-sized bed; comfortable sitting area, open-plan luxury marble shower room and separate loo. 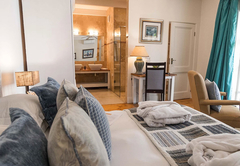 This spacious room, set in the eaves of the main house, opens onto a private wooden deck overlooking the courtyard garden, swimming pool area and inspiring mountains views. This room has a king-sized bed (which can be made up as twin beds). This large, airy room is set in the eaves of the main house, opening onto a private wooden patio with incredible views of the mountains surrounding the village. 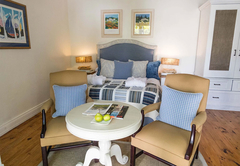 King-sized bed, comfortable sitting area, luxury shower room and additional single bed. 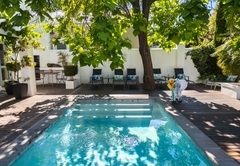 Situated in a quiet corner of the guesthouse, the room opens onto a vine-shaded patio and the tranquil swimming pool area. This spacious room has a king-sized bed (can be made up as twin beds), a comfortable sitting area and open-plan luxury shower room. 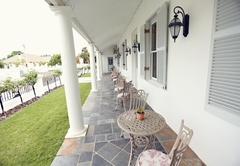 The Veranda Suite is set off the main house's front veranda. 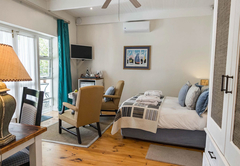 It overlooks the rose garden and a quiet residential street.It has a King Size bed, a separate dressing room and a cozy lounge with a comfortable sleeper couch. Response timeAshbourne House typically responds to requests in 5-10 minutes.